When you’re thinking about a nose job, you either don’t care how it’s done… you just want to make sure your surgeon can deliver the result you want and that’s it. Final. Over. Period. Or, you may join a growing group of people who want to research the procedure in detail to learn the pluses and minuses of open vs. closed rhinoplasty or Technique A vs. Technique B. If that sounds familiar, this blog is for you. Most people have a hard time understanding nasal tip surgery. Taking down a bump on the bridge is easy to understand. A little shave here or there…it makes sense. But, it’s harder to wrap your head around how we make your tip smaller without removing a lot of cartilage and having it fall in over time. Many plastic surgeons aren’t even comfortable working on your tip. For example, tip deprojection or bringing your tip closer to your face, is one of the harder things to do in rhinoplasty. Many plastic surgeons tend to avoid significant changes to the tip in favor of making the nose smaller by concentrating on that bump on the bridge (sometimes a little too much). So, one of the most common reasons both men and women want a revision nose job is that they think their tip is still too big. So how do we do it? We use highly controlled procedures. One of our favorite techniques involves dividing the tip cartilage, overlapping the edges by a measured amount, and suturing it back together in a way that is stronger than it was at first (shown below). We can measure exactly how much we want your tip to move. And, depending on where along the cartilage we divide it, we can also change the angle your tip makes with your upper lip and correct any tip asymmetries without having to worry about it changing over time. So, whether you’re considering your first nose job or a revision, you should know that these tools, if done right, can be a really powerful and predictable way to give you the smaller, refined tip you want like the one you see below. 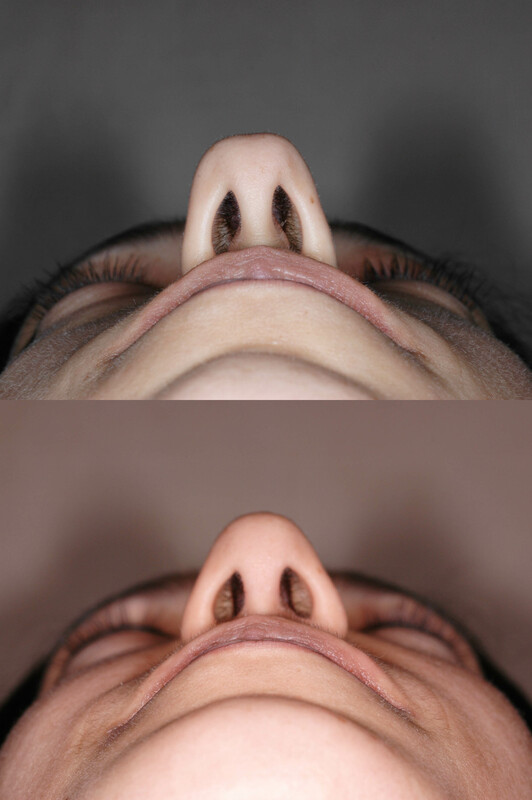 For more before and after photos of our rhinoplasty and revision rhinoplasty results, check out our rhinoplasty gallery.